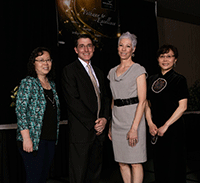 The Pathway to Excellence event recognizes PNNL staff for achievements that have helped to enhance PNNL's reputation. Researchers at PNNL file an average of one invention report each business day. As such, recognizing the outstanding performance of researchers at the Lab is essential. The PNNL Pathway to Excellence celebration does just that, in acknowledging the advancements made by inventors at PNNL. At the April 1 event, one researcher was named Inventor of Year and two others as Battelle Distinguished Inventors. Named the Inventor of the Year, Nie was selected for her significant contributions to the future of renewable energy. She's helped develop large-scale electrochemical energy storage technologies, which are key to widespread use of renewables such as solar and wind. As a key member of PNNL's redox flow battery team, Nie has developed electrolytes and additives that significantly improved the performance of new battery technologies. Her work also includes research in materials, catalysis, metal organic frameworks, and other porous materials. Nie holds ten United States patents, three foreign patents, has 18 pending patents, and 39 invention disclosures. Additionally, she has been recognized as a key contributor on 11 licenses. Her career accolades include an R&D 100 Award in 2012 for lithium battery improvements, and an FLC Award in 2013 for transferring redox flow battery technology to two commercial companies. With 14 U.S. patents, six foreign patents, and ten patents pending to her name, Bennett was named as a Battelle Distinguished Inventor. Bennett was honored for her work in advanced materials and energy. As a senior research scientist, she has pioneered innovations in thin-film coatings, micropower, and nanostructures for lithium batteries. Her technologies have been licensed to three commercial companies. Also named as a Battelle Distinguished Inventor, Li was honored for the advancements she's made in materials and coatings, which can contribute to faster computers and improved fuel cells. She holds 18 U.S. patents and nine foreign patents, with 15 patents pending. Her work as a senior research scientist focuses on nanomaterial synthesis and film deposition. Congratulations to all of the Pathway to Excellence honorees.